Following a great year in 2010 with the launch of two yachts over 30 metres, Sunreef Yachts continues its success with a new contract for a Sunreef 82. The Sunreef 82 DD, DD for double deck, is a concept giving several advantages: an owner suite on the main deck, a large and bright saloon, and a raised pilot house. Taking a cue from her larger sister Ipharra, the Sunreef 82 DD offers the same good ideas, like a large sundeck and aft deck with the possibility of storage for tenders and toys. Entirely designed by the in-house team of the yard, this 25m catamaran built in composite will be highly customised and will accommodate 7 guests in three cabins. The master suite will be forward, including a Jacuzzi and a gymnasium on the main deck, and wardrobes and bathrooms below in hulls on each sides. The other guests will be in a double and a twin cabin plus a Pullman. 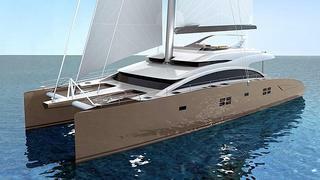 The Sunreef 82 DD is scheduled for a launch in June 2012.